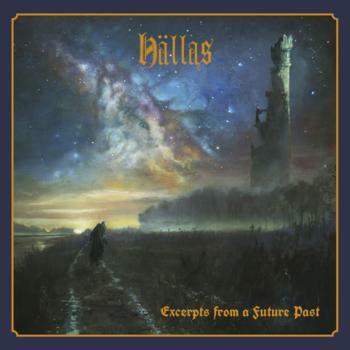 Excerpts From A Future Past is the debut full length release from Swedish rockers, Hällas and a follow on from their eponymous EP from 2015. Given the name, taken from Middle-Earth and the album artwork inspired by a bad day in Mordor, you expect a good slice of epic sword and sorcery and that's exactly what these guys deliver. So far, no surprises, but buckle up because Hällas are not just here to make up the numbers. Formed in 2011 it's easy to see what they have been doing, putting in the hard yards, learning their craft and never forgetting how to play hard rocking music with feeling. Although firmly rooted in the classic rock of the 1970s, this is not an exercise in ticking boxes. The opening track, The Astral Seer draws you in with a pastoral introduction which adroitly gives way to a blazing jazz-rock riff and never lets up for an instant. These time-travelling warriors of rock have plenty of ammunition to hand and it is all on display here and on Repentance. Throughout the album, Hällas show that they are a tight, technically proficient outfit, who play with and for each other, rather than over and against. It would be unfair to pick out individual musicians as everyone plays his part from subtle guitar and keyboard interplay, to joyous soaring jams and driving, operatic adventures. But this is not 5,000 notes per second playing for the sake of it. Hällas have a strong sense of melody and pure rock and roll which should also appeal outside the mainstream metal audience. No track is allowed to rest in its comfort zone for too long, and if Star Rider sounds a little ponderous, it is only by comparison with what has gone before, while its audience participation friendly hook will doubtless win the band new admirers in the course of 2018. The two epic closers, Shadow Of The Templar and Illusion Sky find the band in expansive mood shifting effortlessly between intricate guitar work, galloping, urgent rhythms and backed by meaty keyboard playing, until finally the guitar drops down to bring the adventure back home, echoing the start of the journey, the quest is done, the warrior returns. Escapist it may be, but perhaps if there were a few more heroes around with a strong moral compass, and a desire to defeat the forces of evil, we'd all be better off for it. Having built up an enthusiastic following amongst metal fans in Sweden (no mean feat given the amount of talent emanating from Scandinavia) and on occasional forays into Denmark and Germany, Hällas are taking to the road in Europe in 2018, following up the release of this album, which has been re-pressed by the label having initially sold out. They are already booked in for festivals in Germany (Wurzburg), Norway (Bergen) and the Netherlands (Tilburg). On the evidence of this release they have enough promise to stoke many a wizard's cauldron. They have the potential to build on this first, commendable effort, it is up to you to meet the challenges ahead - Enjoy!! I, a mere commentator, will be watching, and listening with interest.